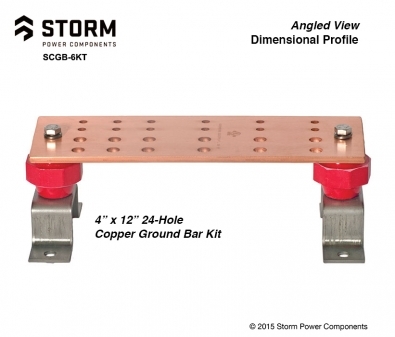 Storm Power's Ground Bar Kits enable multiple ground points to be connected quickly and easily. With 16 pre-drilled holes, this .25" x 4" x 12" Ground Bar Kit meets or exceeds NEC 2011 grounding requirements. Nickel plating and silver flashing are also available, as well as non-kitted copper ground bars or mounting kits sold separately.